I never imagined my life without you, in all of my existence I never fathomed the idea of you not being there to guide me, to laugh with me, to bless me or to simply have a Scrabble afternoon where we would discuss valid acronyms or two letter words that would skew our game just that much... you were fun, Grandma... you were so awesome to be around and something as simple as holding your hand could comfort me to no end on any given day. I always looked forward to that time of the day when I could come visit you and sit next to you in your room; whether we were having a trivial conversation about how much I hated my job or a serious discussion about how to raise my daughters, every word that you uttered was full of wisdom and love and that is something I will never forget. 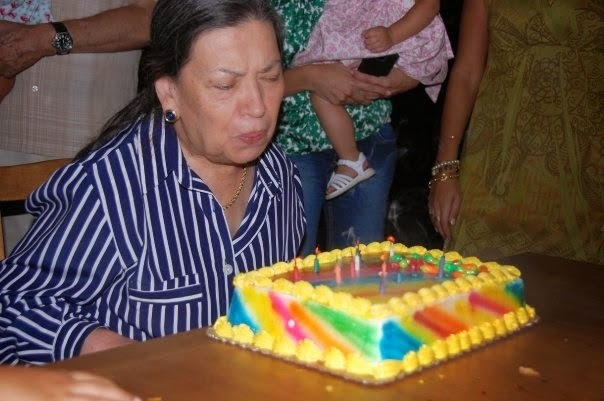 You would have been 86 today; we would be celebrating and singing a loud "Happy Birthday" song, you would be holding my hand, I would be enjoying you and loving you like I did every single day of my life and we would be eating cake... you loved cake and I loved your sweet tooth... I loved everything about you my dear Grandma! Today my world feels a little sadder and life is a whole lot emptier but somehow I know that you are celebrating BIG today and all the angels are throwing you the party you deserve. I know you wouldn't like to know that it took so much of me to write this post and that I can barely see what I'm typing because of the tears that fog my eyes, gosh my eyes are literally burning...it hurts so much Grandma! We will release tons of balloons to the sky today, in your name and in the name of every wonderful moment that we were blessed to spend with you. Please smile for us, Grandma and know that you are ever present in our lives and in every single thing we do. I love you and miss you forever! The following are two pictures of my Grandma celebrating her 80th birthday; full of life and love. 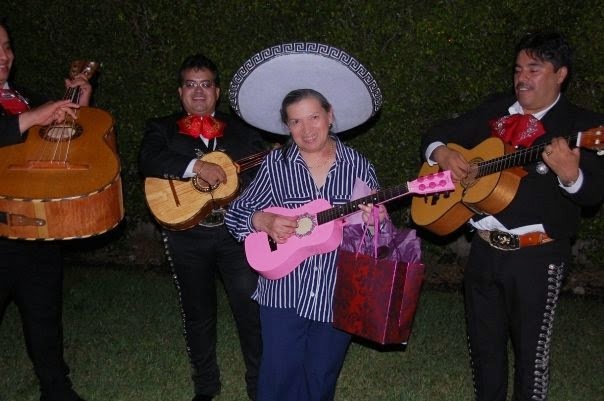 I am sure the mariachis are playing for her today and her soul is joyful and grateful just like it was in this picture! This day is for you, Grandma! Happy Birthday! As a mother, I believe it is my responsibility to give my children everything they need; I give them food, clothes, school supplies and MUCH more... I perceive them as happy and content children whose needs and wants are always met and I, in turn, feel satisfied for doing a "good" job... but am I REALLY doing a good job? I know my children are content...but are they APPRECIATIVE? Do they really understand what things are worth? Do they grasp how LUCKY they really are to have what they have?....furthermore.. am I giving them TOO much? We live in such a wasteful society, where we take everything for granted and nothing holds true value... iPhone 6 coming out? Yes! $749? Who cares! I still have a perfectly good 5s but I GOTTA have the new cooler looking model... When did that train of thought become our norm? So the problem lies with the fact that this unappreciative society is where our children are growing up; to them it's normal to throw perfectly good things in the trash, it's acceptable to want newer things just "because" and they have a constant expectation of having more; it's like they are genetically programmed to never be fully satisfied and to feel like there's always something missing. Our children are growing up believing that they are entitled to millions of toys, never-ending entertainment and endless "things" that really never teach them anything and never fill the emotional voids that are part of life; we aren't teaching our kids to be appreciative because we live a constant state of "excess", we aren't promoting positive emotions and we certainly aren't nurturing caring feelings. So how can we raise appreciative kids? What are some of the basic concepts that can help our children become rich in feelings and emotions rather than rich in needless possessions? Can we do this collectively as a society? Can we change the negative spiral effect that we are part of? I have compiled a list of things that can contribute in changing these negative patterns of self-absorption and materialism into positive appreciation and a desire to focus on intangible things. Encourage basic manners: teaching your kids to say "please" and "thank you" goes a long way. When you teach basic manners, you are building a foundation of appreciation and you are enabling your child to value other people's emotions by showing respect at all times. Teach them the concept of money: kids NEED to know how much things cost and consequently they should understand the process involved in making money. We can't raise kids who are oblivious about the fact that money does not come out of a black hole and that parents need to work hard in order to obtain the money that goes towards purchasing everything they have. Allowances and money management lessons are great approaches. Expose them to the needs of the world: making a child aware of the needs in the rest of the world allows him to understand his place in society and it helps in making him more considerate of others and be more appreciative of what he has. We were at church the other day and the priest brought up and astounding fact: "In places like Haiti, $100 can feed a family of 4 for a WHOLE YEAR". Can you think about the last time you spent $100 on a special birthday dinner? I can! I'm sure more than one person will answer yes to this question. Give them responsibility: a child is more likely to understand the value of hard work when he has to perform some sort of duty, whether it's a small chore at home or some other type of "work; it is highly advisable to get children engaged in some sort of contributing routine. When you give a task to a child, you change the focus from what they can GET to what they can GIVE and that makes for a very positive change. Do not engage in consumerism: Consumerism is one of the worst ailments of our society; it encourages the acquisition of goods and services in greater amounts that are needed. When parents live a life of over-consumption, a child is more likely to model such behavior and interpret it as acceptable; this then become a cycle that is hard to break so it's best to never start it. Stick to NEEDS vs. WANTS! Do not give into the "gimmes": when we give children more than they need, we are creating an expectation of "get-get-get" and we are weakening their character by placing excessive value on things rather than on developing strong relationships with the people around them. So as hard as it may be, parents need to stop encouraging the notion of effortless rewards and vane possessions. Encourage children to become "givers": you may be surprised how much children enjoy giving and parents should always encourage children to find pleasure in sharing and helping others. A toy drive around the holidays or a canned food donation will go a long way in teaching this lesson. When we promote a "giving" attitude, we are more likely to raise children that appreciate what they get, no matter how little it may be. These are only a few of the things that will help parents in raising more appreciative kids. We must always remember that the change starts with us parents and that we are raising tomorrow's leaders. Let's keep making the world a better place by teaching our kids the value of people, emotions and feelings and by helping them understand their place in society. We need to appreciate our world in order for the world to appreciate us! It's time for a check up! Last week we visited Disney's Hollywood Studios and spent some time with the Doc; we saw the Disney Jr show, which is still one of Gaby's favorites even though she's not a "baby" anymore. The Doc McStuffins show features some of the most adorable characters and stories; I really enjoy the little songs and all of the episodes where she treats the toys and nurses them back to health. The latest Doc McStuffins DVD is being released on Sept 9th; it features the "School of Medicine" episode along with 5 other bonus episodes where the adorable Doc does her thing, cures the toys and saves the day. 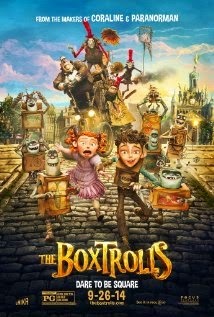 My kids particularly enjoyed this DVD and it is a great addition to their collection. 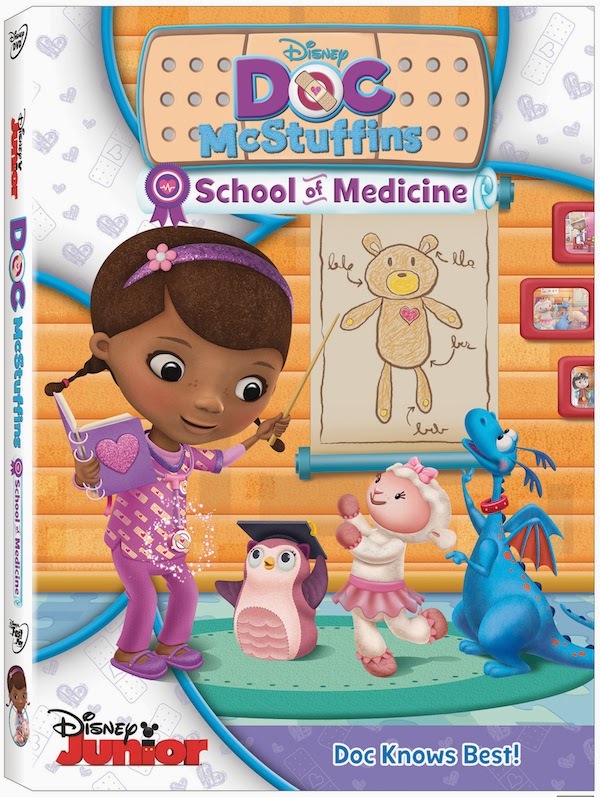 In honor of this release, I am hosting a special giveaway, where one lucky reader will receive a copy of the new Doc McStuffins DVD with the special "School of Medicine" episode. Even though the DVD is geared to younger children, anyone can enter for a chance to win! 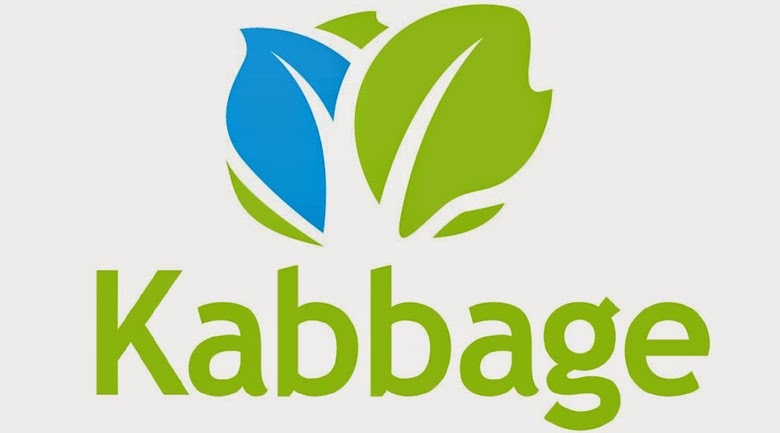 I was recently approached by a representative from Kabbage, a small business loans company that helps people achieve their goals and dreams every day, making for a better future, inviting me to participate in the "Live Your Dream" campaign. Well.. believe it or not, I face a big challenge when it comes to talking about myself. While I do like to share my ideas and write about parenting and such, I can never come up with specific things to say about ME! 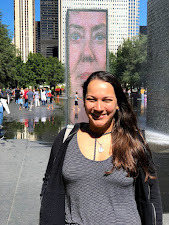 I spent countless hours writing about my kids and their friends, our trips and adventures, parenting tips and a bunch of other stuff that fill this blog's archive, but when someone asks me "what are YOUR dreams? ", I find myself often doing some serious soul searching and then I get nothing. Now, I'm not saying I DON'T HAVE dreams, of course I do.. I want to travel the world, I want to help the poor, save stray animals and so on and I'm sure I could write A LOT about each one of those, however, I decided to give my readers a chance to participate in this wonderful campaign. A few weeks ago, I posted an invitation on my Facebook page inviting people to submit essays about their dreams and the response was overwhelming and so gratifying... I really enjoye getting so many notes and emails about people's dreams and for a moment, I traveled in time seeing all those dreams coming true.. how wonderful! I received so many responses for this campaign and I was really overwhelmed with all the positivism from my readers. Hearing about people's dreams somehow made this experience SO MUCH BETTER than if I had decided to write about my own. This experience has taught me that there is so much more to people than what we see; that we all have so many different dreams and plans and we all have to work hard at it to achieve what's on our hearts and minds. This campaign has also inspired me to think harder not only about what I want but about how to execute those plans and make them my reality!